At an early morning conference Thursday, Kawasaki announced to its dealers that the venerable KLR has seen its final year of production. The news was broken to Kawasaki dealers prior to the opening the doors of the AIM Expo to the media. Thanks for sharing, Creekside! As it has been for so many, the KLR650 was my gateway drug. I grew up riding motorcycles--had a 50cc and a couple old 100cc "enduros" on the farm, but had never seen or even heard of "off-road" riding. I had no idea that people rode motorcycles in the forest. 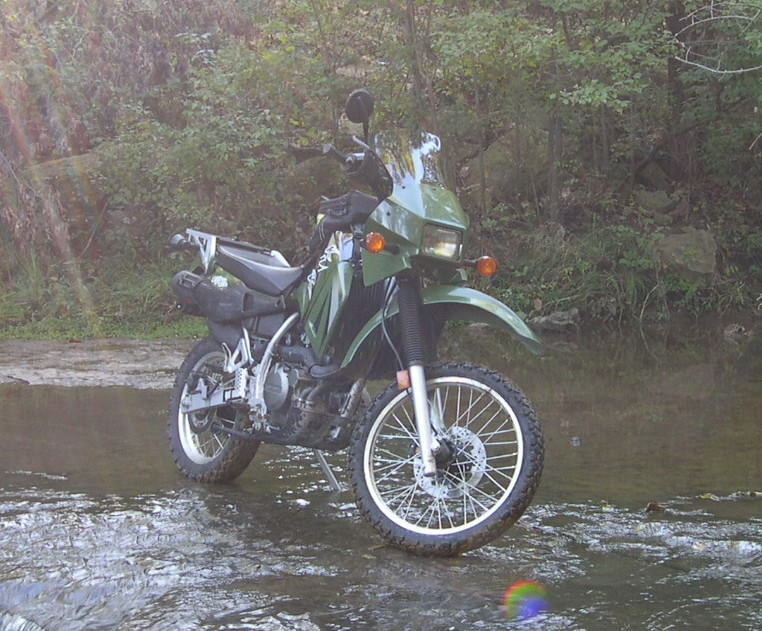 After a 5 year dry-spell without a motorcycle, I stumbled onto the Backroads Touring Kansas website, where I saw hundreds of pictures of folks riding KLR650s and the like on gravel roads exploring the countryside. Big city life had me missing the country. I was immediately hooked. My 2003 KLR650 took me a lot of places. I miss her. I imagine Kawasaki will have a replacement. Not everyone will be happy about the new bike, but my money says the have something to fill the gap, and announcing the death of the KLR650 is part of the media buzz to build suspense for the new models. It is possible there will be a twin announced as a replacement. If it has the same weight at the current 650 but more power and possibly even a 6 speed they will have a worthy replacement. It would also be one that could be engineered to be Euro 4 & 5 compliant and hence meet our EPA requirements as well. The inexpensive small bore singles market is pretty crowded. The Royal Enfield Himalayan (441 c.c., 450 lbs, 24 hp) is only $2,800 new out the door with insurance and tags in India. Having just put about 1,400 miles on one I would say this is a market that Kawasaki probably would not wish to compete in. The Himalayan was comfortable, pretty vibration free, got really good gas mileage and pretty tough. They are all over in India and the shops didn't have any in for repair. something I read said it would be replaced with a new KLX 550. Is the new 2019 Honda 450 L dual sport the direction that small displacement dual sport bikes will be heading, including perhaps a replacement for the 650 KLR? Reviewers are pretty happy with the new Honda. Thanks for sharing. Would love a 300# bike that could pull the front in 3rd.